As humans we are all susceptible to emotional harm, feeling powerless from time to time is what makes us who we are. There is nothing weak about feeling vulnerable, but there is a tone of underlying defencelessness that can cause us frustration and anger. In a material world with so much turmoil and instability, it is important for us to protect ourself more than ever from the negative energies that circulate this globe. Our emotional well being depends on how well we take care of our emotional state of mind. 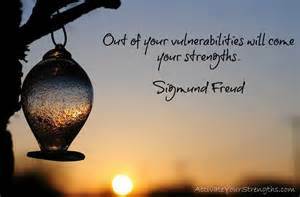 Vulnerability reduces itself when our level of conscious awareness grows. ‘Don’t be a fool, look both ways before you cross the road’, this is what we were taught when we were kids, a valuable tool our parents offered us to help keep us safe. What can we offer ourselves now, in these present times that will help to keep us from harm? Our intuition is our natural born guide, there is no greater friend indeed than your Intuitive Nature. Strengthening our intuition is no easy task, not when it’s opponent is the Ego. There are very few circumstances when our Soul and our Ego ally together for the good of the whole, most often than not, the Ego seems to win out the battle. Our Soul (the source of our intuition) is but a tiny whisper over the loud and obnoxious voice of the Ego, so we must listen carefully as to not miss our Souls message. Patience, resilience, faith and most of all trust, are the tools you will need in order to strengthen your intuition. The wonderful thing is you have all of those attributes tucked away in your inner tool box, just waiting for you to tap into them. No one likes to feel vulnerable, not if it is in a negative and uncomfortable way. There are so many characteristics to being vulnerable, but typically the most common element is other people. Not everyone in our life has our best interest in mind, there are many a lesson to be learned from the people that cross our path. The more you begin to understand your intuitive nature, the stronger your gut feelings will lead you away from vulnerable situations. Not only will your intuition allow you to feel more empowered, it will raise the level in which you take care of yourself as well, keeping you out of arms way of other humans that are not invested in your goodness, the way you are. In a world that seems to demand more and more that we be less passive, finding our way to our inner tool box and adjusting how we deal with our vulnerability, is very important now. If feeling weak seems to be a part of your inner language, change your mind and make strengthening your intuition your passion and your mission instead.